A construction worker from Seattle is seriously injured but alive after an 80 foot fall, but for a fellow worker, a similar incident ended in tragedy. The UK construction sector has a health and safety record that is the envy of the world. And when we see some of the incidents in other parts of the world, where health and safety regulations are less exacting, it brings into focus why these rules are so important. A case in point concerns the dramatic events that took place in Seattle, Washington, last week. The Seattle Times ran a story about a construction worker who fell from the 20th floor of a new building and whose life was spared when he miraculously landed in a net eight floors below. Construction health and safety is not just about having the appropriate construction signs in place and wearing the right PPE. Anyone watching from the UK would be shaking their head in disbelief that someone could be working 20 floors up and not be secured to the building. A little knowledge can be a dangerous thing. When the story was covered in the UK by the Daily Mail the keyboard warriors came out in force to suggest the whole thing was a non-story and the builder had actually had his life saved by a safety net that was doing its job. Of course, this is complete nonsense. The net was in place to catch any falling debris dropped by those working above, and to protect people and property at ground level. It was certainly not intended for catching falling people – if it was, it would not have been positioned 80 feet below them! Of course, the word “miraculous” will always polarise opinion, but there is no disputing that this is one very fortunate man. Having said that, however, as the 30 year old lies recovering in hospital with multiple broken bones to the lower extremities, it might be a while before he realises just how lucky he was. The unnamed man’s lucky escape came just days after another construction worker fell to his death in similar circumstances just a few streets away in the same city. The 35 year old welder fell 50 feet from a building under construction on John Street, and died in hospital the same day. Both incidents are currently under investigation by the U.S. Occupational Safety and Health Administration (OSHA). The two construction sites are unconnected, and both have been subject to past inspections, with no problems reported or red flags raised. However, these incidents raise some uncomfortable questions. 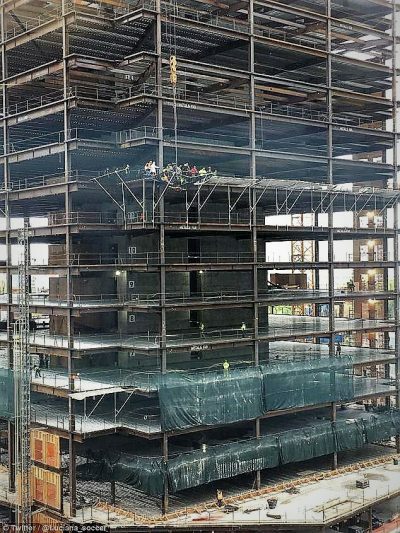 Health and safety rules might be less rigorous in the US than the UK, but they still dictate that when working at this sort of height, workers must be clipped into some form of harness to prevent exactly these kinds of tragic events from occurring. Clearly, neither the 30 year old who escaped with his life nor the 35 year old who so tragically lost his were using this type of equipment when they fell. Local investigations continue into both incidents.